* These elegant earrings by Mariell have a delicate Cubic Zirconia motif on top with marquis stones cascading into a genuine freshwater pearl drop. * Plated in high gloss silver rhodium, these wholesale earrings have the look of fine jewelry at a price that would surprise even a trained eye! * Add these classy earrings to your store's bridal accessory showcase to top off your collection. 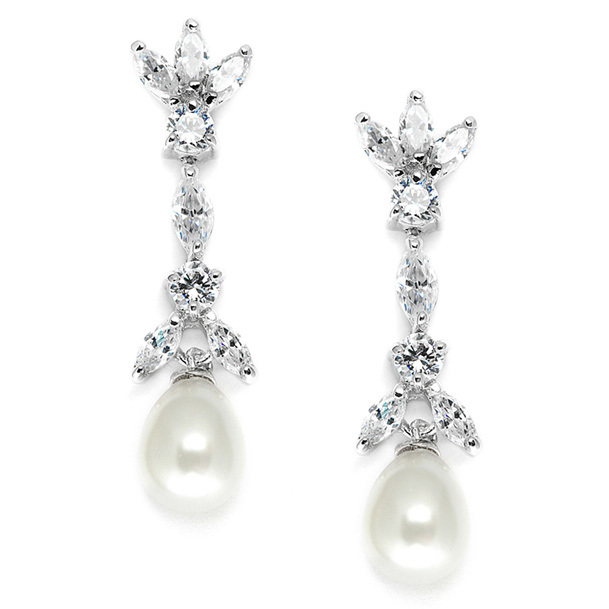 * Mariell's elegant 1 1/4" h earrings have a dainty Cubic Zirconia "tulip" motif on top cascading into a lustrous genuine freshwater pearl drop.